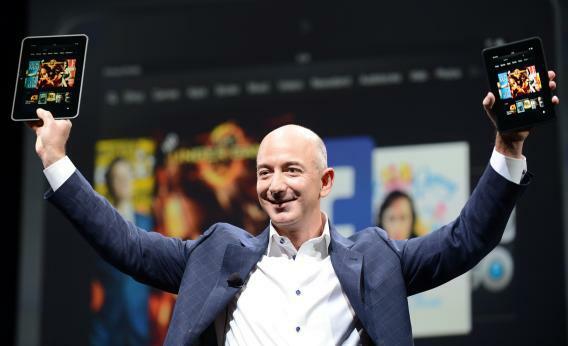 Jeff Bezos’ plans for the Washington Post: How he could Amazon-ify the newspaper. Jeff Bezos shouldn’t just keep it for himself. Amazon CEO Jeff Bezos introduces the new Kindle Fire HD during a press conference in September 2012 in Santa Monica, Calif. When it comes to the Washington Post, if you are not thinking about the Kindle, you are not thinking like Jeff Bezos. With the Kindle, Amazon has an exclusive delivery mechanism for content, sold exclusively by it. It has the only wireless network that doesn’t require customers to go through an extortionate telecom contract. Not even Apple or Google have that. Kindle’s 3G is free, which means that Bezos can use that network to reach you. Or rather, Amazon can use it to reach you. Amazon didn’t buy the Post; Bezos the private investor did. The Washington Post gives Bezos a news generation operation—and now he should hand that news generation operation over to Amazon. Think of the possibilities! The Post could show up as your browser start page; it can show up in the “special offers” that accompany the discounted Kindle. It can show up on Amazon product pages, alongside e-book libraries, you name it. Bezos tips his hand here. The Post isn’t known for its coverage of restaurant openings or scout troops. Yet Bezos seems to think the Post might return to its previous experiments in hyperlocal news. One way this would be possible is if the news is personalized. And this is where the new Post could combine elements of Amazon and Facebook. Let us hypothesize. If you are a Kindle owner, chances are Amazon already knows far more about you than Facebook, because it knows what you buy. That’s the real information gold. Facebook has clumsily been trying to get at your purchase history for years with browser-spying gimmicks like Beacon. But Amazon doesn’t need to violate your privacy. It already knows all about you. Your customer record tells Amazon where you live, what you buy, what you want to buy, and a great deal more that it can infer from that information. Currently, it uses that data to make product recommendations—sensible enough. But news stories tailored to your demographic and purchase history could be far more captivating than a simple product recommendation. The news stories wouldn’t have to be infomercials or puff pieces. If you’ve been reading Thomas Pynchon’s Inherent Vice, maybe reviews of his upcoming Bleeding Edge will start showing up on your Kindle. If you buy diapers, maybe articles on child-rearing will show up. But these articles, puff pieces or not, will often mention products and brands, and those can be conveniently hyperlinked to Amazon product pages. Then there’s the local angle. The existing Post team obviously doesn’t have the resources to cover local events around the country, and I doubt most of them are keen on the scout-troop beat. So the Post banner will be extended to cover many more reporters, perhaps becoming a franchise. The Huffington Post is probably a reasonable model for what Bezos has in mind, but on a larger and more distributed scale. I don’t know exactly how Bezos could plan to generate that specialized local content—perhaps he’ll take stuff off the PR wire or buy it from eager local papers around the country. But content is cheap, especially content about restaurant openings. He would have no problem getting it. And Kindle owners could get news tailored to their geographic location, their demographic, and their buying habits. In effect, the Post can cease to be a newspaper by and for national elites and instead become a more amorphous entity that caters to all stripes of people on an individual basis. The existing Post team will form the backbone of national news coverage, but they will in no way be the core of the Post, because there will no longer be a core. Parts of the existing Post will float or sink depending on how much visibility they can retain. Ezra Klein, who has built an individual sub-brand within the paper, will see his stock rise on the strength of his following if he sticks around. Beltway pundits such as Dana Milbank might see their stock fall because they don’t have a following. And tenured op-ed mainstays like Richard Cohen will plummet into oblivion. Bezos, or Amazon, would probably exert some editorial influence for relevant issues like tech worker visas and state taxes, but I doubt he wants to be Rupert Murdoch. Maybe he’ll pull a William Randolph Hearst and force everyone to read Krazy Kat, but I doubt that, too. That’s not his business; his business is selling. He doesn’t expect you to vote; he expects you to buy.